This area is popular with boaters for swimming, viewing, diving, fishing and wilderness camping. Hardy Island Marine provides a safe anchorage and is only an island at high tide. A park bench located on Hardy Island Marine provides an excellent spot to sit and take in the beautiful scenery of the area. The warm, clean and green waters surrounding the area are reminiscent of a more tropical place. This park is subject to southeast winds during the winter; use caution when anchoring. As the anchorage is known as the Hardy Island Anchorage, the Council of British Columbia Yacht Clubs requested that the name of the park be changed. On October 21, 2004, the Legislative Assembly passed Bill 74 to officially change the name. Bring your own drinking water as potable water is not available in this park. There is a small protected anchorage area but mariners should use caution when anchoring, as there is a rocky bottom. This park consists of Musket Island and Hardy Island and is strategically situated, being midway from Vancouver, Princess Louisa and Desolation Sound. 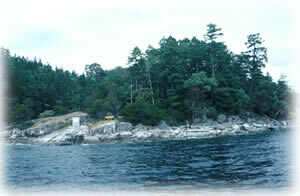 This park can be approached from either Malaspina Strait or Jervis Inlet via Telescope Passage. Approved Musket (Hardy) Island Marine Provincial Park Purpose Statement and Zoning Plan [PDF]. On October 21, 2004, the Legislative Assembly passed Bill 74 to officially change the name of this park to Hardy Island Marine from Musket Island Marine. There are opportunities for canoeing or kayaking in this park. The park allows walk-in camping but there are no formalized sites. Ocean swimming with a very rugged and rocky shoreline. There are no lifeguards on duty at provincial parks. This park provides many scenic marine view scapes. The park allows walk-in camping but the sites are not formalized and there are no facilities provided. Recreational opportunities are limited.